After a long and bumpy journey, the Chestatee River Diving Bell has found a new home in Dahlonega’s Hancock Park. Several people shine forth as heroes in this story. One hero is Chris Worick, who became fascinated with the diving bell, and has spent almost five years researching and reporting his findings about its history. He has enthusiastically promoted its preservation through speaking engagements, building models and displays for public education and enjoyment, and spending time as chairman of the Diving Bell Committee. Our next hero is Anne Amerson who started researching the diving bell in 1991. She introduced it to the public by writing articles for The Dahlonega Nugget, Volume 2 of her “I Remember Dahlonega” books, and Georgia Backroads magazine. In 2010, while chairing the Diving Bell Committee, Anne went to our next hero, Bill Hardman, for advice on raising the funds needed for the diving bell’s preservation and display. He and his wife, Helen, were intrigued. They took the ball and ran with it. They gave a dinner party for people they thought would be interested, and thus the Diving Bell Fund-Raising Committee was formed. 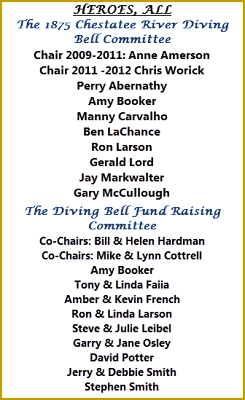 Among the fund raising committee members were heroes Mike and Lynn Cottrell, who offered the services of Cottrell, Inc., in Gainesville, GA, to restore and preserve the diving bell. The firm arranged for the diving bell’s transportation and donated the expertise, labor and the materials necessary for its preservation and display. Then the Cottrells stored it at their farm until it could be moved to its new home in Hancock Park. The committee organized a fund-raising event in the Cottrell Circle C Ranch barn that was beautifully orchestrated by hero Lynn Cottrell. The event raised $39,000 in cash and almost as much in the form of in-kind contributions. 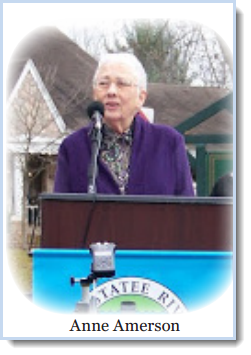 Then hero Helen Hardman informed the City about the availability of matching-funds grants available from the Appalachian RegionalCommission. She did the research and gave valuable assistance in the grant writing process that resulted in the City winning a $50,000 matching-funds grant to build the plaza that houses the diving bell. The temperature on Friday, November 30, 2012 was hovering around 30 degrees, but that didn’t stop a crowd of approximately two hundred people from gathering in Dahlonega’s Hancock Park for the Ribbon-Cutting Dedication, and Grand Opening of the Chestatee River Diving Bell Plaza. Mayor McCullough recognized various government officials attending the event. 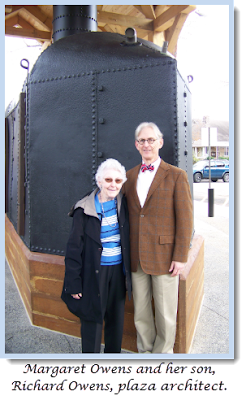 Historians Anne Amerson and Chris Worick then gave short talks about the history of the Chestatee River Diving Bell. Anne noted that when she first started telling people about the discovery of a diving bell used in the mountains of north Georgia to mine for gold in a river bed, they looked at her like she was crazy! McCullough welcomed all and invited Reverend Jeff Ross of Dahlonega United Methodist Church to give the invocation. After humorously noting the absence of a special prayer for a diving bell in his book of prayers for all occasions, Rev. Ross delivered his own blessing for the occasion. 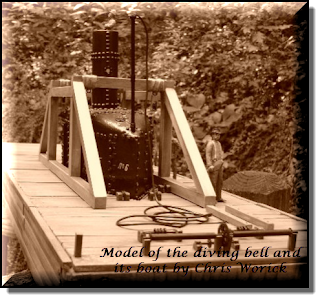 Chris Worick acknowledged Richard Owens, who grew up swimming and fishing around the diving bell without knowing what it was. Now an Atlanta architect, Richard designed the plaza which houses the diving bell. Chris noted that “The design for such a special artifact demanded a unique and symbolic structure, which Richard has accomplished here.” He went on to explain that the 50 x 17 outline of the base structure reflects the dimensions of the boat to which the bell was attached. The river is represented by wavy lines and river rocks of various sizes imbedded in the concrete. Slate rocks used for the bases of the eight heart cypress columns were donated by the Consolidated Gold Mine. Both Chris and Anne spoke about the dedicated efforts of literally hundreds of people who contributed time, energy, knowledge, and/or money to the diving bell project over the past five years. Plaques recognizing those who made especially significant contributions are mounted on a large boulder just outside the plaza. Three interpretive signs explain the history of the bell, its usage, and the restoration process accomplished by Cottrell, Inc. The keynote speaker was Mike Cottrell, whose generosity was the turning point in bringing the diving bell project to fruition. Mike also stressed the importance of teamwork and noted that all of the men who worked as a team on the bell during its restoration were enthusiastic about the project and were present for the dedication. The people who came to Hancock Park for the ceremony have gone home now, but others are journeying there to view the bell. At any given time of any day of the week, people can be seen walking around the plaza, reading the interpretive signage, touching the bell’s pitted iron surface, and gazing at the unique artifact with interest and wonder. Many people have been given credit for their contributions to the Diving Bell Project and rightly so. However, others have worked so quietly behind the scenes that little is known of their involvement. 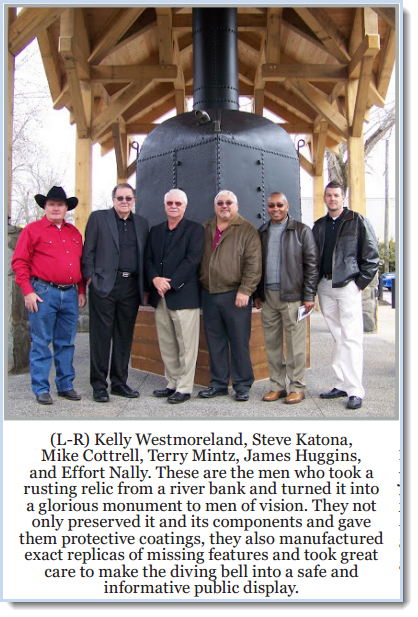 The Lumpkin County Historical Society has been one of the key players in transforming the Chestatee River Diving Bell from a rusty old hulk to a restored and researched artifact that now has its own plaza and attracted national interest. Over the years, the Historical Society’s basic function has been to promote the preservation and public display of the Chestatee River Diving Bell as an important part of Lumpkin County’s history and heritage. This has been done by individual members with support from the Board of Directors. 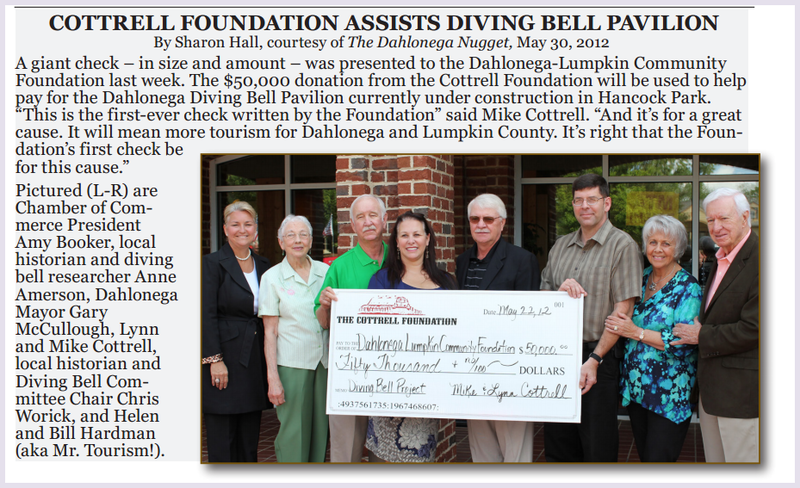 The Historical Society Board of Directors became involved when Achasta personnel agreed to donate the diving bell to the City of Dahlonega. Raising funds to build a plaza to display the Diving Bell (obviously a non-profit venture) needed a 501c3 organization to adopt it as a project so that donations could be tax-deductible. The Historical Society fit the bill. The Historical Society Board agreed to accept donations to help the City build the project. The Board also voted to donate $5,000 of “seed money” to the project. Historical Society members Chris Worick and Anne Amerson authored interpretive signs needed to explain the bell’s history, usage, and significance. When it became apparent that the City had no funds available to pay for the signage, the Historical Society once again came to the rescue by agreeing to pay for them, including bronze plaques recognizing those who made significant contributions to the project. 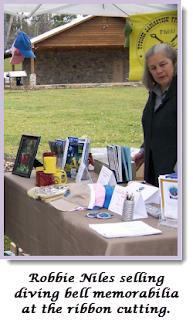 Another key player was Historical Society Secretary and graphic artist, Robbie Niles, who volunteered many hours designing the interpretive signs, plaques, rack card, and the fund-raising event ads for The Dahlonega Nugget. 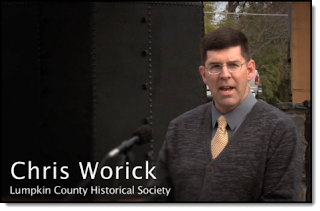 While serving as an officer of the Historical Society, Chris Worick also served as chairman of the Diving Bell Committee. He created exhibits telling the story of the bell, which have been displayed in the Lumpkin County Library, Welcome Center, and Gold Museum, where they have attracted considerable attention, especially the scale model he has created of the diving bell and the boat to which it was attached. Chris continues to do extensive research looking for still-missing pieces of the puzzle. He also maintains a Facebook page for the Historical Society where he presents the most accurate and up-to-date information about the diving bell. 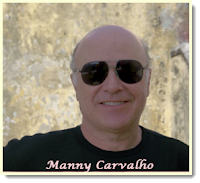 Historical Society Board member Manny Carvalho also served on the Diving Bell Committee, but his greatest contribution has been to create a web site for the Society that includes a Diving Bell section. There, he reported on the progress of the bell from the river bank to the ribbon-cutting ceremony, using his excellent writing, photographs, and almost daily updates. His Diving Bell page also reports the most up-to-date research and includes articles written by him, Chris Worick, Anne Amerson, and diver Bill Waldrop. Historical Society member Anne Amerson first saw the bell and began writing about it in 1991. In 2009, at Mayor McCullough’s request, she helped form a diving bell committee with the mission of rescuing, restoring, preserving, and putting the artifact on display. She has been involved with all phases of the bell’s saga, and has worked closely with Chris Worick. 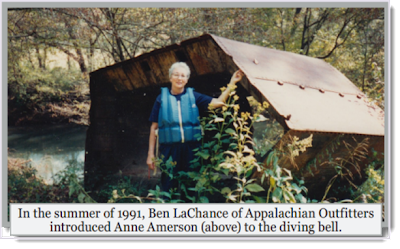 The first Historical Society member to become aware of the diving bell and the first to attempt to preserve it was Charter Member Margaret Owens whose family owned the land on either side of the Chestatee River where the bell was pulled out in 1981. She recognized that it probably had historical significance and offered to donate it to the Dahlonega Gold Museum. After the Department of Natural Resources decided not to accept the gift due to lack of space and funds, Margaret offered the bell to the Historical Society. The Society also had to decline for the same reasons, and the bell was later sold with the property. Margaret’s interest in the bell has been ongoing, and she was thrilled when her son Richard was selected to design the Hancock Park Plaza. The diving bell committee was a constant force in driving this project to completion. They are shown below at the ribbon cutting ceremony with perhaps a bit of a "mission accomplished" smile. Article originally appeared in the Now and Then Newsletter, vol 39, Dec. 2012. Photo of large check is courtesy of the Dahlonega Nugget.